Red Bull Racing chief technical officer has paid tribute to Sebastian Vettel after he and the team secured their fourth successive title at the Indian Grand Prix. 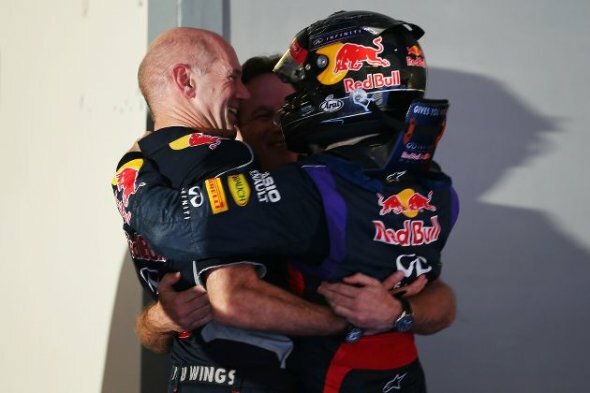 Newey joined Red Bull at the start of 2006 and has been instrumental in their success across the past few seasons. Newey believes that Vettel's fourth title elevates him among the greats of Formula 1. "It’s difficult to verbalise what these Championships mean to be honest," he said. "Coming into the weekend we knew we had a good chance for both titles, but it’s one thing thinking you have a good chance and quite another to achieve it. It’s almost a relief that we’ve done it, it’s going to take a while to sink in. It’s a tribute to all the hard work, talent and focus of the guys and girls back in Milton Keynes." "We started off with a very good season in 2009, against all expectations, and to have built on that with four consecutive doubles is absolutely stunning. More than anything I’d like to thank every single member of the team for that. Sebastian must now be considered one of the all-time greats." "He makes mistakes sometimes, but he always learns from them; he’s very humble and the success and fame he has achieved over the last few years has never gone to his head; he remains with both feet firmly on the ground." "The atmosphere we have in the team is very good; we’re just a straight forward team and we don’t pretend to be anything we’re not. These four Championships are a result of all the hard work, creativity and enthusiasm of everyone in Milton Keynes."